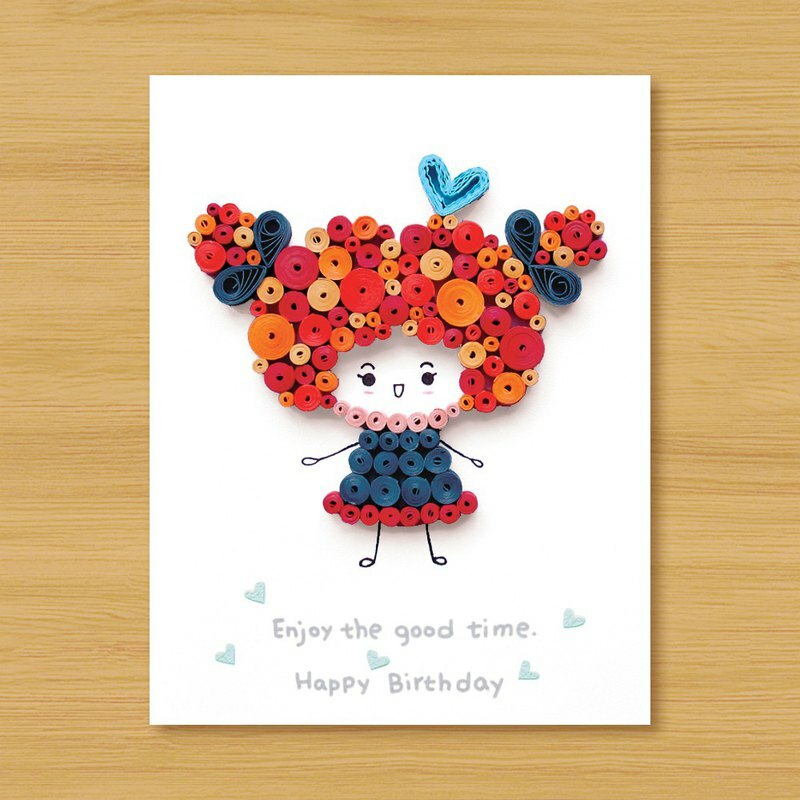 Handmade Roll Paper Card: Enjoy the good time. Happy Birthday_Girl_A (birth card, lover card, thank you card, universal card) ■ Size: about 13.5 * 10.3 cm ■ Material: art paper, painted pen ■ Form: fold in half, turn left and right, write on the right side of the inside page ■ Handmade envelope: pink envelope ■ Change of cover text: The text can be customized. Please use English characters as the main word. ■ Packing: transparent thick zipper chain bag, foam, cardboard, environmentally friendly packaging love the earth :) ■ Note: Please be aware that the difficulty of this card is limited to the fact that each paper roll cannot have exactly the same diameter, so the production will add more small paper rolls, but the overall style will not change, and will not have much influence and change. :) [Store Home] https://www.pinkoi.com/store/dddesign Christmas goods: https://www.pinkoi.com/store/dddesign?tag=%E8%81%96%E8%AA%95%E7%AF%80&i18n_tag=%E8%81%96%E8%AA%95%E7%AF%80&page=1 New Year's merchandise: https://www.pinkoi.com/store/dddesign?tag=%E6%96%B0%E5%B9%B4&i18n_tag=%E6%96%B0%E5%B9%B4 Animal goods: https://www.pinkoi.com/store/dddesign?tag=%E5%8B%95%E7%89%A9&i18n_tag=%E5%8B%95%E7%89%A9 Valentine's Day Products: https://www.pinkoi.com/store/dddesign?tag=%E6%83%85%E4%BA%BA%E7%AF%80&i18n_tag=%E6%83%85%E4%BA%BA%E7%AF%80&page=2 Mother's Day merchandise: https://www.pinkoi.com/store/dddesign?tag=%E6%AF%8D%E8%A6%AA%E7%AF%80&i18n_tag=%E6%AF%8D%E8%A6%AA%E7%AF%80 Father's Day merchandise: https://www.pinkoi.com/store/dddesign?tag=%E7%88%B6%E8%A6%AA%E7%AF%80&i18n_tag=%E7%88%B6%E8%A6%AA%E7%AF%80 Christmas Card: https://www.pinkoi.com/store/dddesign?tag=%E8%81%96%E8%AA%95%E5%8D%A1&i18n_tag=%E8%81%96%E8%AA%95%E5%8D%A1 Birthday card: https://www.pinkoi.com/store/dddesign?tag=%E7%94%9F%E6%97%A5%E5%8D%A1&i18n_tag=%E7%94%9F%E6%97%A5%E5%8D%A1 Valentine Card: https://www.pinkoi.com/store/dddesign?tag=%E6%83%85%E4%BA%BA%E5%8D%A1&i18n_tag=%E6%83%85%E4%BA%BA%E5%8D%A1 Mother Card: https://www.pinkoi.com/store/dddesign?tag=%E6%AF%8D%E8%A6%AA%E5%8D%A1&i18n_tag=%E6%AF%8D%E8%A6%AA%E5%8D%A1 Father Card: https://www.pinkoi.com/store/dddesign?tag=%E7%88%B6%E8%A6%AA%E5%8D%A1&i18n_tag Animal Card: https://www.pinkoi.com/store/dddesign?tag=%E5%8B%95%E7%89%A9%E5%8D%A1&i18n_tag=%E5%8B%95%E7%89%A9%E5%8D%A1 Character Card: https://www.pinkoi.com/store/dddesign?tag=%E4%BA%BA%E7%89%A9%E5%8D%A1&i18n_tag=%E4%BA%BA%E7%89%A9%E5%8D%A1 Sticker card: https://www.pinkoi.com/store/dddesign?tag=%E8%B2%BC%E9%91%BD%E5%8D%A1&i18n_tag=%E8%B2%BC%E9%91%BD%E5%8D%A1 Graduation Card: https://www.pinkoi.com/store/dddesign?tag=%E7%95%A2%E6%A5%AD%E5%8D%A1&i18n_tag=%E7%95%A2%E6%A5%AD%E5%8D%A1 Teacher Card: https://www.pinkoi.com/store/dddesign?tag=%E6%95%99%E5%B8%AB%E5%8D%A1&i18n_tag=%E6%95%99%E5%B8%AB%E5%8D%A1 Luminous card: https://www.pinkoi.com/store/dddesign?tag=%E5%A4%9C%E5%85%89%E5%8D%A1&i18n_tag=%E5%A4%9C%E5%85%89%E5%8D%A1 Shake card: https://www.pinkoi.com/store/dddesign?tag=%E6%90%96%E6%90%96%E5%8D%A1&i18n_tag=%E6%90%96%E6%90%96%E5%8D%A1 Wedding Greeting Card: https://www.pinkoi.com/store/dddesign?tag=%E5%A9%9A%E7%A6%AE%E8%B3%80%E5%8D%A1&i18n_tag=%E5%A9%9A%E7%A6%AE%E8%B3%80%E5%8D%A1 Key ring: https://www.pinkoi.com/store/dddesign?tag=%E9%91%B0%E5%8C%99%E5%9C%88&i18n_tag=%E9%91%B0%E5%8C%99%E5%9C%88 Postcard: https://www.pinkoi.com/store/dddesign?tag=%E6%98%8E%E4%BF%A1%E7%89%87&i18n_tag=%E6%98%8E%E4%BF%A1%E7%89%87 .